Since Facebook's original blip up in the first few hours of post-IPO trading, Facebook shares are down 37% in 8 days of open market public trading This is not merely an epic IPO flop, but it will surely go down in history as . . .
. . . and the downside that yet remains is SIGNIFICANT, which intrinsic value analysts, without ties to the syndicate firms suggesting a fair value for Facebook shares of $9.50. And as implausible as it may seem now, there exists a scenario that could render the stock essentially worthless. Concurrent Increase in Deal Size & Offering Price -- This was discussed as if it had never been done before. Are you kidding? Hot IPOs are often adjusted in this manner, and always in response to exhaustive market "reads" throughout the syndicate. And do you really think the massive syndicate which included just about every Wall St. firm would have so egregiously misread market demand? And do you think Facebook senior executives and its Board were also asleep at the switch on this? If so, perhaps you would be interested in buying the Brooklyn Bridge -- I've heard it is for sale". The reality is that NONE of the above factors caused the wholesale disappearance of investors between when the deal was priced at the end of the day on May 17, 2012, and when the Facebook IPO shares began trading the next day. Why Did Investors Suddenly Get "Cold Feet"? So what caused droves of investors to suddenly get cold feet on one of the most highly anticipated IPOs in history? And keep in mind about a week before pricing, retail investors were hearing this deal was so hot, the stock could hit $75 to $90 per share on day one. In fact, many were bemoaning getting squeezed out of shares at or near the offering price by institutional investors. Disturbing "Big Brother" Relationship with the Federal government (e.g., CIA, FBI, NSA, Homeland Security), in fact it's becoming increasingly obvious that much of Facebook's growth was been clandestinely facilitated by the U.S. government (more on this in the next section). Highly Vulnerable Business Model, where Facebook stands one short electronic bridge away from the mass exodus of an already intensely unhappy and distrustful user base. Click here for a sample proposal made to Google to do precisely this. Modern Day Wizard of Oz? 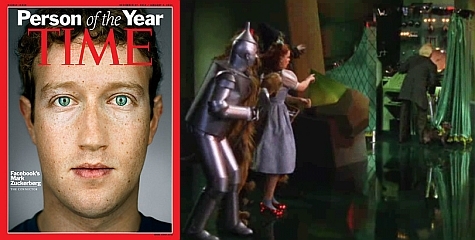 Facebook's Face-plant has exposed CEO Mark Zuckerberg as a governmental puppet with a mere wunderkind facade, who is nothing more than a modern day Wizard of Oz . . . with the curtain pulled back of course. How else could a socially retarded college drop out become the CEO of the largest social network and register a net worth equal to the bottom 20% of ALL U.S. households by the age of 28? If you saw the movie Social Network, Mr. Zuckerberg's notorious social shortcomings were displayed, and there seems to be a conspicuous gap between when he had a couple dozen colleges signed up and when Facebook's global reach was realized. How did he pull that off? He had a great idea at the right time, but he is NOT responsible for seamlessly managing the growth of fully integrated servers throughout the world -- ONLY the vast resources of the US government are capable of doing something of this massive scale without a hitch, and the quid pro quo was the secret establishment of "Big Brother" surveillance on an unsuspecting populace. And this also explains why Facebook supports censoring the internet via the dangerous CISPA legislation, which has already been passed by the House of Representatives. Evidencing how Zuckerberg is in way over his head at this point is his continued silence as Facebook shares carry on with their precipitous free fall. If he were a legitimate CEO, he would have been out in front of this from day one, defending the viability of the franchise and addressing concerns about strategic growth with thoughtful responses. 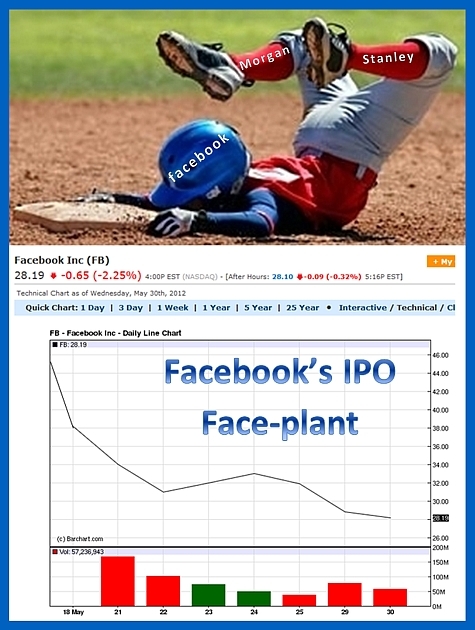 The widely circulated May 17 communiqué which was issued two hours prior to deal launch played a material role in instigating the sudden evaporation of investor interest in the Facebook IPO, which was accomplished with a very powerful weapon known as the Truth. Moreover, efforts to drive down Facebook's market capitalization will continue until such time that Facebook: (1) ceases its perpetrated fraud against Spencer C. Young; and (2) removes Erskine Bowles from its Board of Directors, the details of which were articulated in a May 23 transmittal to Facebook Management and its Board. and return the $50 million in net worth thus stolen, 80% of which will be used to establish a foundation to help others similarly victimized.